We are standing in the playground. There’s a little girl I know who is clearly beside herself. The school bell just rang and her mum isn’t there. The other adults are like me – we all know her, but we’re not her mum. And right now, all she wants is her mum. I can see the panic building in her eyes as the tears seep down her cheeks. I’m almost paralysed with recognition. I used to feel that way when I was her age. Nothing could make me calm down. Nothing could make me feel better. She’s having a panic attack, and I don’t know what to do. Thankfully, since I was seven years old, there is a much greater understanding of what anxiety is and how it can affect children. Why do children get anxious? We’re not talking about everyday worry here. We’re talking about anxiety as a mental health condition. So why was it that I felt anxious as a child? Why do children today feel anxious? Parenting educator Maggie Dent says there are a number of reasons why children get anxiety. I know my anxiety surfaced after a big move (from the UK to Australia). 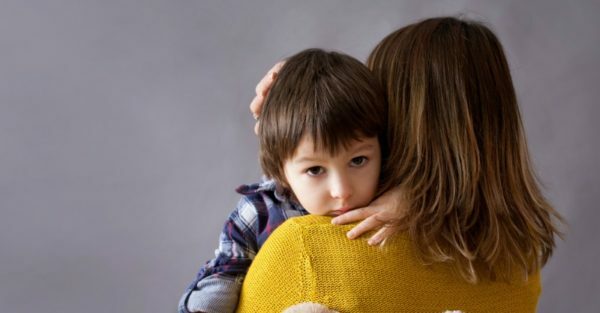 Being aware of these triggers can help you be aware of what might be contributing to anxiety for your child. Anxiety can manifest in many ways. Perhaps if we can start by understanding what it feels like we can notice the symptoms. Psychologist Karen Young from website Hey Sigmund says that children often don’t know how to describe what they’re feeling, they just know that something doesn’t feel “right”. Maggie says that anxiety can manifest in a number of ways that you don’t expect. When a child is feeling like something is wrong, don’t tell them that everything’s okay. Clearly, for them, it’s not. If you tell them that they’re fine, they will start to think there’s something really wrong with them. Karen suggests that parents “ride the wave” of anxiety with their children. Stay by them, breathe with them. Let them know you understand what they’re going through, and that you know they can get through it. Maggie Dent suggests grounding your children with touch with a strong tickle at the top of their back and helping them to breathe deeply and calmly. Distraction, she says, can also work a treat. By distracting a child by being silly or showing them something interesting (like birds outside) you are essentially leading their thoughts from the amygdala (the part of the brain that’s engaged when they’re anxious) to the prefrontal cortex (where more rational thought takes place). Knowing all the factors that can trigger anxiety is helpful, but you can’t always control those triggers. Maggie has some key tips on how we can create homes that are a powerful buffer to the anxious brain. That could be having slow Saturdays and Sundays where no one gets out of their pyjamas before noon, or playing soothing music in the late evening with all screens turned off. Maggie believes that we live in a world that makes our children more stressed, without enough time to simply play and exist. If you’re having a stressful morning, show the children how you deal with it. Once you get in the car, get everyone to do some deep breathing; show them how you do it, and let them follow your lead. Instead of running around the house trying to make sure everything is done, just sit down on the lounge for a moment and chill. Gather your children around you and just have a chat. Make slowing down and taking time out a normal part of their lives. Next time I see an anxious child in the playground I won’t try to make them feel ok, I’ll make sure I sit it out with them and then have a chat to their parents next time I see them. The more we all understand about this condition, the better we’ll be. Want to read more about children’s anxiety? Check out Karen Young’s terrific book, Hey Warrior.